Gorillas are big and strong and you might wonder What Do Gorillas Eat which make them such strong and muscular. Gorillas are herbivores by nature which means that they mainly eat plants. They are not carnivores which means that they do not eat meat or hunt other animals for food. We have gathered complete information on “What Do Gorillas Eat” which will give you an overview of Gorilla Diet. We have listed down all the fruits and plants that are part of the Gorilla Diet along with their favorite food, the amount of food they eat and the minor diet variation that exists among its different species. Gorillas are herbivorous and mainly consume plant material as their diet. It include leaves, stems, roots, young branches, buds, barks, piths, seeds and fruits. Gorillas also eat insects like ants and termites. Occasionally, gorillas also eat soil and ash in a little amount that possibly helps in regulating their digestive system. As Gorillas are herbivorous in nature, they predominantly consume vegetarian kind of food. Gorillas are also very selective and do not eat a vegetation as a whole, instead they may only eat the foliages, stems, roots, fruits or pith of a particular plant. The diet of Gorilla in the wild depend on vegetations found in their habitat and on the season of the year. As not all plants are evergreen, so in the wild the diet of gorillas change with season. Gorillas also eat some invertebrates like ants, termites, grubs, caterpillars and larvae. In rainforests, gorillas eat leaves, stems, flowers, seeds, fruits, berries, barks and pith of bamboo. They also eat insects especially ants, termites and their larvae. The quantity of these components, especially of fruits and biscuits which are rich in calories, are changed according to the health condition of a gorilla. They are also given eggs and nuts. For drinking, they are sometimes given herbal tea and sugarcanes beside fresh water. As Gorillas are herbivorous in nature so they like to eat vegetations. Among vegetarian stuff, fruits are the favorite food of gorillas and it make about 67% part of their diet if available in abundance. Mountain Gorillas also like to eat the leaves, little shoots and sap of bamboo. Ants and termites are the invertebrates mostly eaten by Gorillas, however, they also rarely eat grubs, larvae and caterpillars. As all the subspecies of gorilla do not live in the same habitat, so the vegetations they consume vary according to their habitat. Every species and even sub-species of Gorilla consume different number and species of plants and insects, which indicate that they have a food culture. Western Gorillas consume high-fiber diet including foliages, stems, barks, flowers, fruits, piths, insects and soil. Eastern Gorillas live at high altitude in the montane and sub-montane forests of East Central Africa where fruits are shortly available, so a large part of their diet comprises of foliages. Fruits of the genera Dialium, Landolphia, Chrysophyllum and Tetrapleura make a large part of the diet of Gorillas if available in abundance. In case of insufficient availability of fruits, they consume woody vegetations and low-quality herbs. In dry season, they eat vegetation having more fibers like the bark and leaves of Aframomum and Palisota. According to suggestions made on the basis of some pharmacological and ethnographic studies, some specific foods (such as the seeds and fruits of many Cola species containing caffeine) eaten by Gorillas possibly have medicinal value. Western Gorillas living in Gabon eat the stems, roots and fruits of Tabernanthe iboga, which is a psychedelic shrub that have a simulating effect on the Central Nervous System and in large doses can induce hallucinations due to the presence of a compound Ibogaine. Gorillas eat banana, guava, apple and other such common fruits in captivity. However in the wild, gorillas eat about more than 100 types of fruits of different plants found in their habitat. The favorite fruits of Gorillas in the wild are of the genera Dialium, Tetrapleura, Chrysophyllum and Landolphia. Gorillas are mammals and feed its younger ones with mother’s milk. Baby gorillas exclusively depends for diet on their mothers for the initial five months of life. Their mothers feed them at least once per hour till the age of five months. After five months, baby gorillas start eating some vegetation. At the age of about 18 to 20 months, baby gorillas are fed by their mothers at least one time per two hours. Baby gorillas are weaned at the age of about six years, and after this age their diet totally comprises of vegetations like adult gorillas. Gorillas do not take specific diet for lunch, dinner or breakfast. In the wild they eat what they found of their choice, like foliages, fruits and some insects. However, in captivity they are given specific diet for lunch, dinner and breakfast. As gorillas do not eat meat, eggs or dairy products, so vegetation is their basic source of proteins to develop strong muscles. Gorillas also eat caterpillars, ants and termites that also provide them some proteins. Ants and termites are also rich in calcium and iron. Gorillas do not eat meat or flesh of other animals, however, they eat some invertebrates like caterpillars, termites and ants. As Gorillas are primates, it means they have a well-developed nervous system which need Vitamin B12 for normal functioning. Vitamin B12 founds only in the foods of animal origin like meat and dairy products, and do not found in the vegetarian diets eaten by gorillas. So what is the source of Vitamin B12 in the diet of gorillas? A satisfactory answer of this question is that gorillas do not wash vegetations before eating and it have a little amount of soil, particularly the root and stem parts. Gorillas also sometimes eat soil and ash. Soil have numerous bacteria rich of Vitamin B12, a possible source of Vitamin B12 in their diet. The Mountain gorillas (Gorilla beringei beringei) inhabits the regions of high elevation that have fruit trees in deficient amount. So, fruits make a very little part of their diet, which is only about 2%. They eat other parts of the plants like leaves, stems, buds and barks as a greater part of their diet, which makes about 86%. The plants they consume belongs to about 142 different species. Plant roots and insects make about 7% of their diet. The Eastern lowland gorillas (Gorilla beringei graueri) consume plants of about 104 species. They have a very diverse diet, which change with seasons. Fruits make up about 25% of their diet if abundantly available, however, they commonly consume leaves and pith. The Western lowland gorillas (Gorilla gorilla gorilla) consume more fruits, which make about 60% of their diet. In the quest of fruits, Western lowland gorillas travel more than any other subspecies of gorilla, that is about 1100m per day. They eat plants of about 97 different species most of which seasonally produce fruits. About 40% of their diet comprises leaves, stems, seeds and insects like ants, termites and caterpillars. The Cross river gorillas (Gorilla gorilla diehli) consume multiple herbs of the genus Aframomum of family Zingiberaceae (commonly known as Ginger family) found in the tropical regions of Africa. However, in rainy seasons they like to eat Anchomanes difformis species of the genus Anchomanes (which is native to the tropical regions of Africa) of family Araceae. Like other Gorilla subspecies, Cross River Gorillas also eat fruits, other parts of vegetation and invertebrates. However, it is unknown that all these things make what percent of their diet. 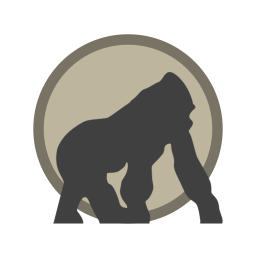 A silverback gorilla is an adult male gorilla, and consume the similar stuff like the other individuals of his species or subspecies, but at high quantity. Their diet comprises foliages, fruits, stems, seeds, pith, etc and insects like termites, ants and caterpillars. The percentage of all these things in their diet depends on their habitat and the time or season of the year. As Silverbacks have double weight and size than their female mates, they also consume approximately double quantity of stuff as compared to them. An adult male Eastern Lowland Gorilla (largest of all the four subspecies of Gorilla) consume approximately 30 kg of vegetations every day, while this amount for an adult female individual of the same subspecies is about 18kg. Adult male gorillas of other subspecies consume about 18 to 20 kg of plants every day, while females consume about half of this amount.